Well, what a year it has been, we have had so many new and exciting things happen here at Lexacom, and I am pleased to tell you we have one more trick up our sleeve for 2018. One of our main aspirations as a company is to continue to improve our products and our services to make life easier for our clients. Our software is continually worked on by our team of dedicated developers using the latest technology, we strive to understand the needs of our clients to ensure we are the very best partner we can be to you and your busy organisation. We understand the importance of efficiency and seamless workflow amongst teams, which is why we developed Lexacom Connect, to allow multi-site sharing. Lexacom Mobile was built to the highest encryption standards as we understand security, and the importance of being able to dictate on the move. We also understand the benefits of speech recognition, and also the historic hurdles faced in using this technology, so we created Lexacom Echo. As an early Christmas present to our valued customers we wanted to share with you our latest offering in our efficiency-boosting suite of Lexacom products and services. I am proud to announce the arrival of Lexacom Scribe, our very own outsourced transcription service. Our team of highly-skilled and industry-specific transcriptionists are here to help with some of your workload at the touch of a button. This is a service which we have fully integrated within the Lexacom 3 we all know and love, quite simply to make life easier for you. Our aim is to remove the hassle of researching and selecting your preferred partner, and also taking the steps to activate this in your existing system. We understand that at a time when you may need to outsource your transcriptions, the likelihood is you are already busy enough, without having to do the groundwork in arranging the cover you need. 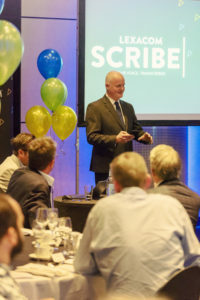 Whether used as an ongoing resource, a service you wish to use on an ad hoc basis during busier spells, or even to cover secretarial absence be it planned or unexpected, Lexacom Scribe is the ideal solution. Here to help, as and when you need it, and you will only pay for what you use with no additional fees. We want to make sure that this news reaches our friends and customers before Christmas, to ensure that you all have the cover and support you need to enjoy the holiday season hassle-free. For more information please do give the team a call, it is always great to speak to you. For now, I would like to take this time to wish you and your colleagues a stress-free, healthy and happy Christmas, and a fantastic 2019. Thank you once again for making the choice to partner with Lexacom.